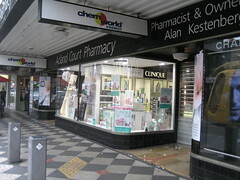 This is the Acland Street frontage of the Acland Court Pharmacy. It is a 1938 former G J Coles & Co store designed by architect Harry A Norris. It is part of the St Kilda Market Complex which is cited in the City of Port Phillip Heritage Review as a Significant heritage building. The doorways are interesting because they have an Art Deco pattern in the terrazzo entrances. Unfortunately they are not looking there best and, in fact, it is rare to see them because they are usually covered by large mats. It would be lovely to see them cleaned up and put on show a bit more often. Now you are getting very close to home. I have always lived in StKilda or socialised there on weekends. How much of Acland Street was Deco? And has any of it been lost in all the redevelopment? Good question Helen. I suspect like most shopping strips in Melbourne (Australia) that buildings from all periods have been lost. No Doubt Acland street was established before the deco era so some Victorian buildings must have been lost at that time. 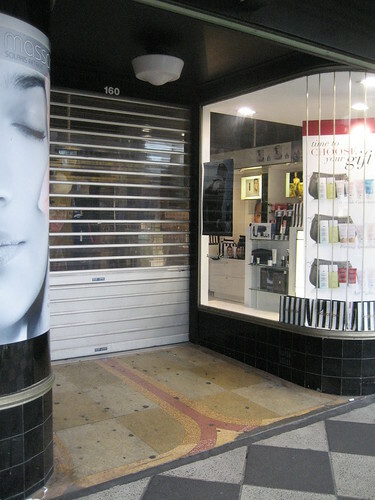 There are a few deco shops further down Acland Street near the Carlisle St junction. I seem remember them changed at street level and very colourfully painted above the verandah.